COMMITTEE OF ADJUSTMENT: December 14, 2017: TOPCA submitted a Letter to the Committee of Adjustment [3p PDF] re: File 'A' 533/17 (Ward 1) on the CofA Agenda (pp48-49), concerning 115 High Street West, owned by HIGH BENSON HOLDINGS INC, who requested a Reduction in the on-site parking standard. ► HEARING LIVE-STREAMED: Via the Committee of Adjustment website (later archived). 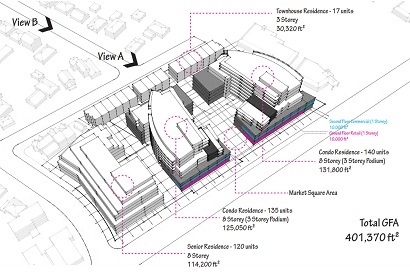 UPDATE - ORAL DECISION: The Requested Variances were granted, while stating that the reduced parking would pertain to the senior residents of the site, and would not impact the parking allocated for Visitor, Restaurant or Commercial use. Text of the Decision will be posted. Images below: Concept building plan approved at PDC on October 26, 2015. The site is still vacant (as of December 2017) -- photo taken April 2017. October 26, 2015 @ 7:00pm at Mississauga Civic Centre (City Hall, Council Chamber). FREE UNDERGROUND PARKING. The City's Planning and Development Committee (PDC), which includes all members of City Council, will review the recommendation (APPROVAL) of the Planning Dept. included in their Supplementary Report. ► Click for the AGENDA + SUPPLEMENTARY REPORT (pp120-177) for the PDC meeting. The applicant (developer) will also present his case for the block development. The public will be able to ask questions and give their views. ► TOPCA made a formal Deputation expressing disappointment and concern with the Planning Dept. recommendation. The Planning and Development Committee will either approve or deny the applicant's request for an Official Plan Amendment (OPA) and Re-Zoning in order to proceed with the proposal. 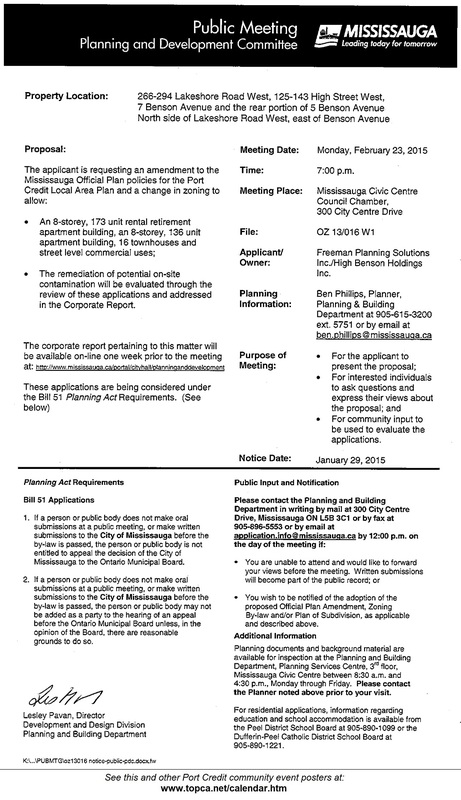 TOPCA DEPUTATION: February 23, 2015 at the City of Mississauga's Planning and Development Committee (PDC). ► Click image to view TOPCA Deputation. Excerpt: "This is a familiar trap. We are asked to accept something because there is no confidence in anything better. We, on the other hand, compare the development proposal to what it could be based on our aspirational Local Area Plan which seeks to accomplish the Port Credit Vision, arrived at after years of consultation and review. We believe in the Vision; we contributed to it. It will attract whatever revitalization is needed." NOTE (1): A follow-up Public Meeting will be held at PDC at a later date (in 2-3+ months) in order to hear the residents' response to the Planning staff recommendation once it is prepared. PDC will then vote, and this decision will form the recommendation to Council for formal adoption. 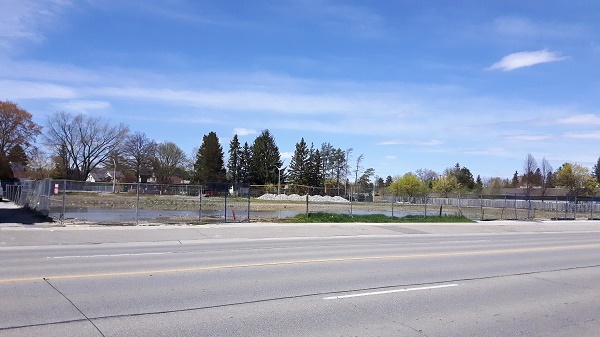 NOTE (2): The developer has already appealed to the Ontario Municipal Board (OMB) for the Official Plan Amendment (OPA) and Zoning By-law changes which could enable this block development to proceed even if the PDC were to refuse the application. The OMB Hearing date has not been set (pending the PDC decision), but TOPCA has applied for Participant status. STATUTORY PUBLIC MEETING - PDC: February 23, 2015 @ 7pm at Mississauga Civic Centre (City Hall) in the Council Chamber. FREE UNDERGROUND PARKING. The City's Planning and Development Committee (PDC), which includes all members of City Council, will hear all sides of the issue. ALL ARE ENCOURAGED TO ATTEND. ► Click image to view MEETING NOTICE. ► Click for the AGENDA + INFORMATION REPORT (pp65-103) for the PDC meeting. The applicant (developer) will present the concept design for the block development; the City Planning Staff will give an overview of the status of the application (Information Report); and then the public will be able to ask questions and give their views. TOPCA made a formal Deputation. The City Planning Dept. 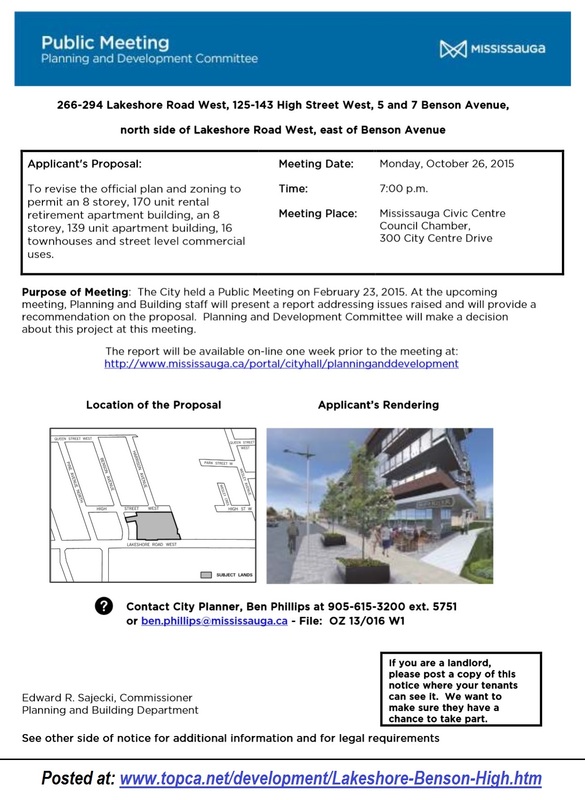 staff will take note of all the comments and prepare a Supplementary Report containing a recommendation for PDC to either approve or deny the applicant's request for an Official Plan Amendment (OPA) and Re-Zoning in order to proceed. Shown at left is one set of elevations appearing in the Plannning Staff Report (p78) to be presented at the PDC meeting on February 23, 2015. ► Below is the SITE MAP for the assembled properties. Click image for enlargement. PORT CREDIT REALTY NEWS: February 2015. Delivered to 1600 homes in west Port Credit. Page 3 article (enlarged) concerns the L/B/H development. Excerpt: "Town of Port Credit Association (TOPCA) is committed to assisting the community by advocating for the interests of the neighbourhood." 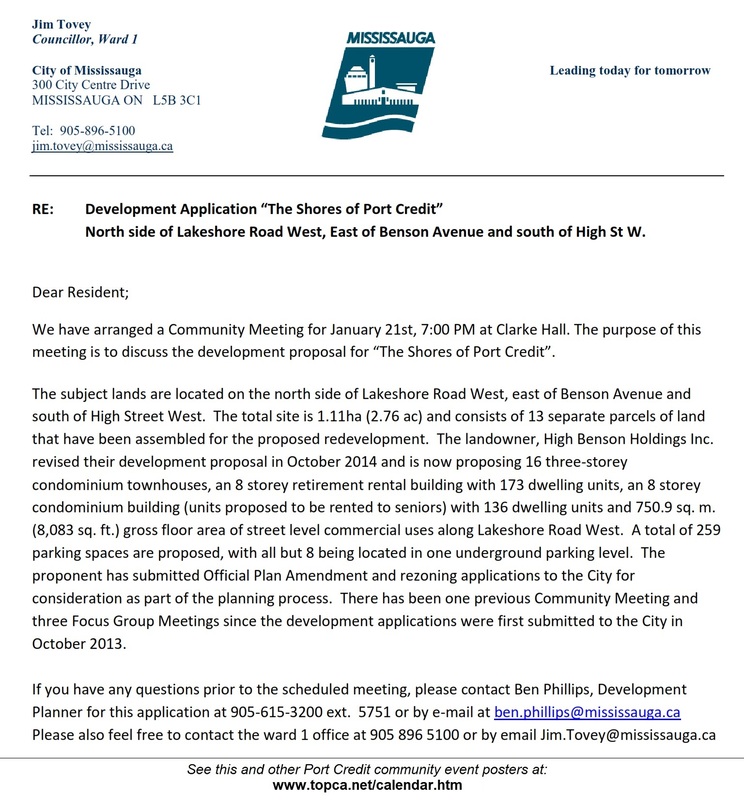 COMMUNITY MEETING: January 21, 2015 @ 7pm at Clarke Hall, 161 Lakeshore Road West. The latest (revised) application was presented and the public was able to ask questions and give their views. The City Planning Dept. staff were present (a staff recommendation has not yet been made). There was a great turnout of over 100 residents! ► Click to view to most recent (October 2014) SITE PLAN (2p PDF). 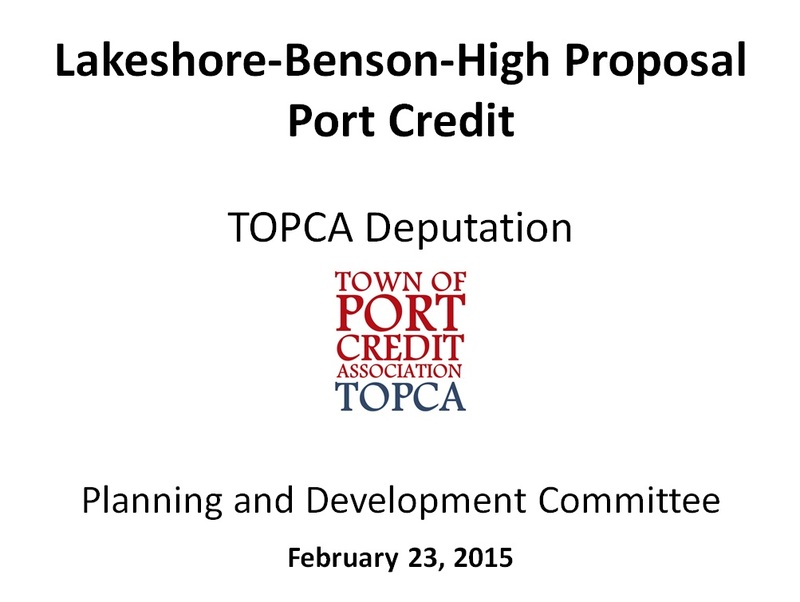 ► Click to view TOPCA's presentation at the Community Meeting. 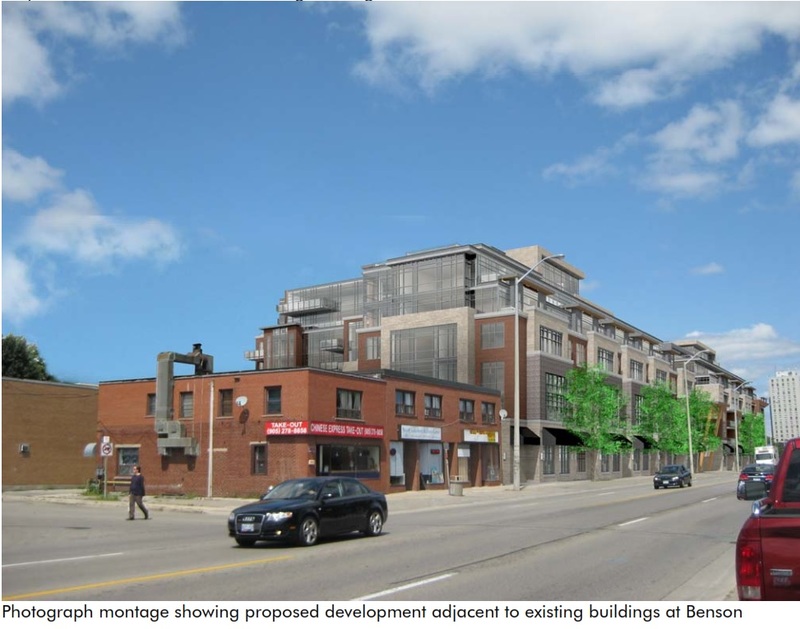 NOTE: The developer has already appealed to the Ontario Municipal Board (OMB) for the Official Plan Amendment (OPA) and Zoning By-law changes which could enable this block development to proceed even if the Planning Dept. were to refuse the application. The OMB Hearing date has not been set, but TOPCA has applied for Participant status. 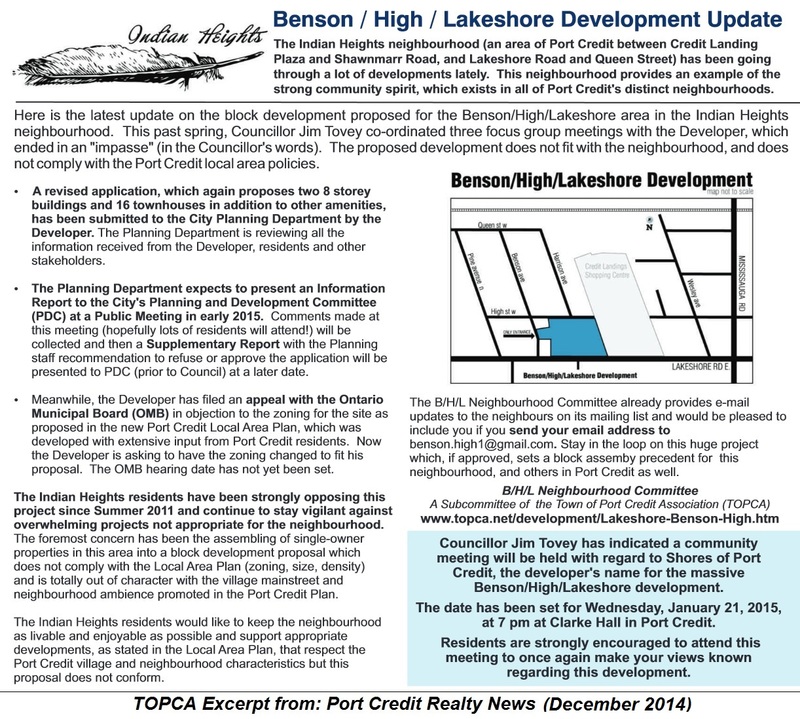 PORT CREDIT REALTY NEWS: December 2014. Delivered to 1600 homes in west Port Credit. Page 3 article (enlarged) concerns the L/B/H development. COMMUNITY FOCUS GROUP: Started March 25, 2014; ended May 27, 2014. 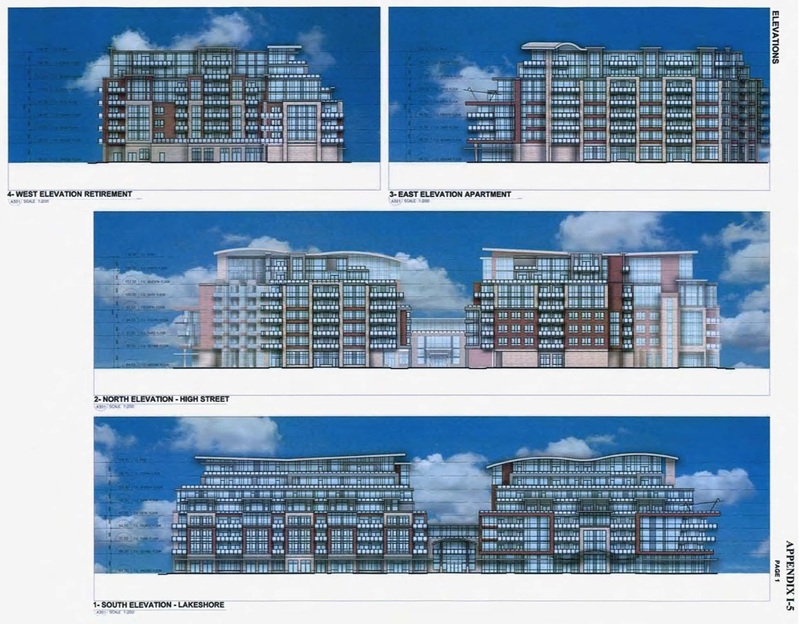 As announced at the Community Meeting on Feb 10, 2014, three (3) Focus Group meetings were convened to discuss the development application for this block proposal. TOPCA and neighbourhood reps participated. ► Click to view the TOPCA Letter (March 21, 2014) sent to Ward 1 Councillor Jim Tovey and all parties concerning participation by the TOPCA L/B/H Committee on the Focus Group. 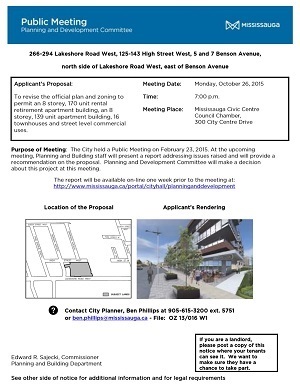 OUTCOME: The Lakeshore/Benson/High development proposal was rejected by residents at the final focus group meeting (May 27, 2014). Councillor Jim Tovey declared an impasse as developer continued to push for over-densification and a land use concept that doesn't fit with Port Credit's village mainstreet character or the established neighbourhood (Indian Heights) which would be walled in and over-shadowed by the encroaching block development. 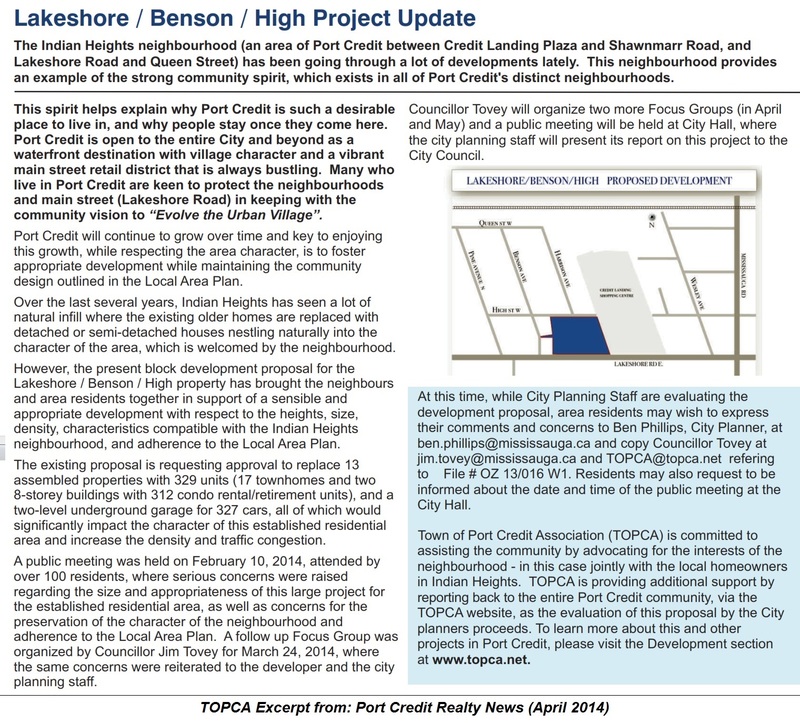 PORT CREDIT REALTY NEWS: April 2014. Delivered to 1600 homes in west Port Credit. Page 3 article concerns the L/B/H development. COMMUNITY MEETING: February 10, 2014 at Clarke Hall. Click image below for full size POSTER created by TOPCA to help promote the meeting, which will be hosted by the Ward 1 Councillor Jim Tovey. ► Click to view the formal Ward 1 MEETING NOTICE (1p PDF). 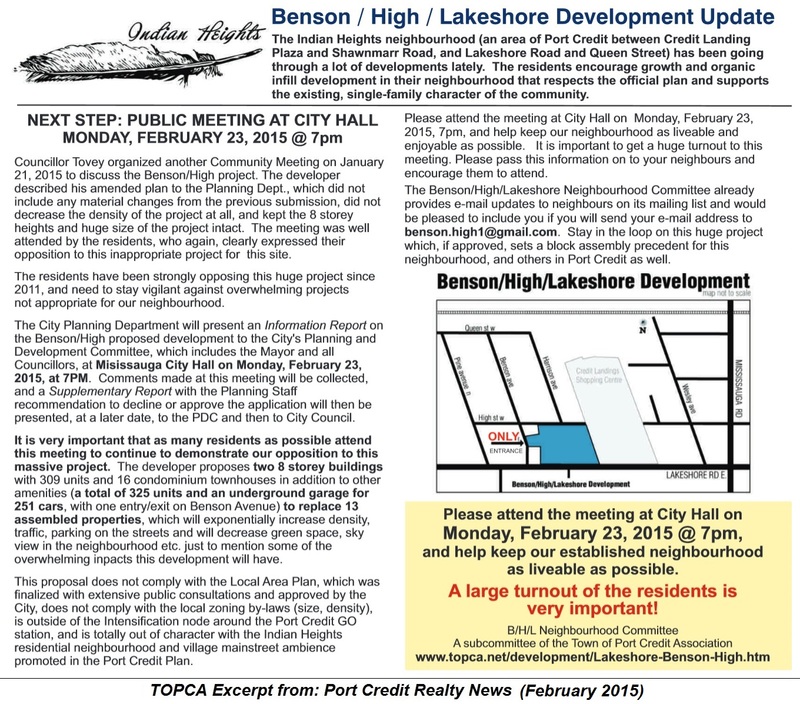 "We (the TOPCA Executive) support the intent and principles as stated in the Letter (dated January 5, 2014) from the residents of the 'Indian Heights' neighbourhood (including members of the TOPCA Lakeshore / Benson / High Committee) pertaining to the application submitted by High-Benson Holdings Inc."
TOPCA's L/B/H Neighbourhood Steering Committee (which includes 20 TOPCA members from the immediate neighbourhood) will continue to advocate for appropriate development on this assembled mainstreet block as the planning process moves ahead. NOVEMBER 2013: An application has now been filed for this site by High-Benson Holdings Inc. The development is called 'The Shores of Port Credit' and is planned as a Continuing Care Retirement Community (CCRC) comprised of two 8-storey buildings: one a rental retirement residence (170 units) with graduated care options. The other would be a luxury condominium/rental building (142 units) for seniors, with a transitional living option. Also included are 17 luxury 2000+sf 3-storey condominium townhouses facing High Street with functional access from underground parking accessible via the main driveway on Benson Avenue. There would be in/out access via Lakeshore Road (beside Credit Landing) for movers, visitors, deliveries etc with an internal road looping around to the Benson Avenue driveway. 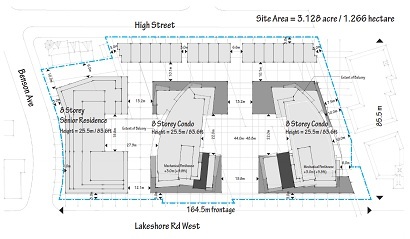 Commercial retail units will be on the ground level of the 4-storey Lakeshore Road frontage. 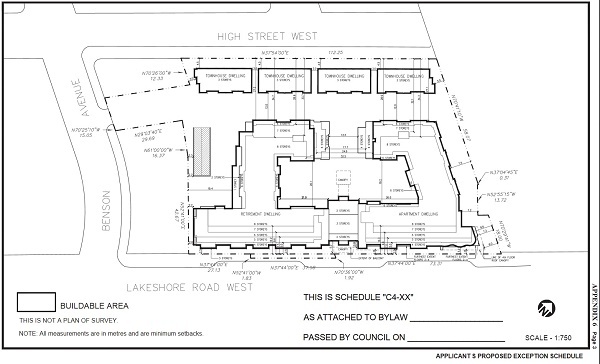 The application requests Official Plan and Zoning By-law amendments. ► Click to view the URBAN DESIGN BRIEF (33p PDF) dated October 25, 2013. 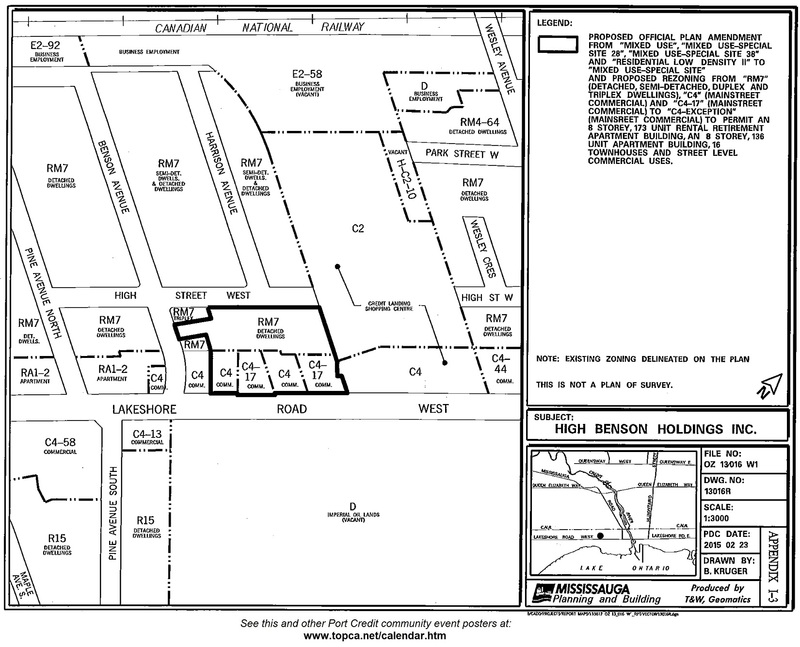 ► Click for proposed Site Plan image enlargement. Tiffany Development has proposed a mixed-use 3.1 acre block redevelopment on (16) assembled properties on the block just west of Credit Landing plaza, between Lakeshore Road West and High Street, west to Benson Avenue (map). The site plans were last modified November 4, 2011. ► Click images for the most recent full-size renderings. NOTE: Four (4) developer-sponsored Community Meetings were held during Summer 2011 to receive public input. While these community meetings were not part of any official public process, City Planning Staff attended in order to monitor the proceedings and provide technical clarifications in answer to residents' questions. It is confirmed that the developer will not hold a 5th community meeting, as stated at the 4th meeting held August 15, 2011. Neighbourhood Steering Committee (NSC): Was formed in Spring 2011 by approx. 20 residents from various streets in the immediate neighbourhood (map) to identify and examine the issues and develop a response to be presented to the community for review. This locally-driven process sought to establish community consensus in response to the developer's proposals. The Town of Port Credit Association (TOPCA) facilitated this process by providing a website platform and e-mail support. ► Inventory of Concerns: July 13, 2011 (2p PDF) compiled by the Neighbourhood Steering Committee as the first step in this process. TOPCA COMMITTEE: TOPCA formally announced at its Annual General Meeting on November 30, 2011 that it was forming a Committee in regard to the L/B/H proposal, and one of the neighbours was elected to the TOPCA Executive. The NSC was merged with TOPCA’s B/H/L Committee given the number of TOPCA members in the area. 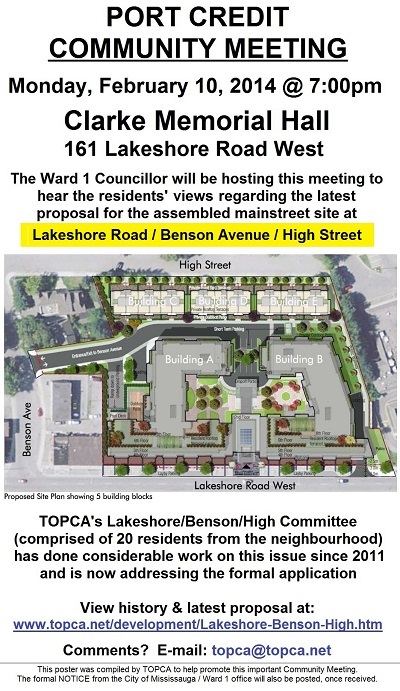 Some TOPCA members from the neighbourhood have volunteered to serve directly on the Committee to ensure the widest possible consultation and local input into a planned formal response which will be sent to the City Planning Dept. and our political representatives. 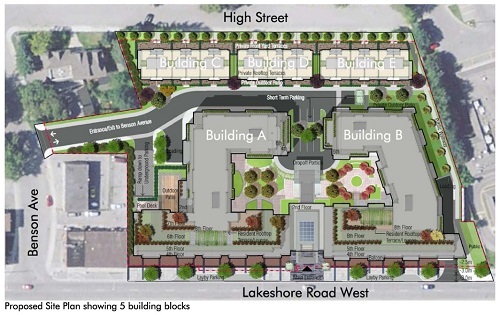 includes metrics and revisions including: additional 3m Lakeshore Road set-back; 10,000 sq ft commercial/office second floor space; Benson Avenue ingress & egress; 2 driveways on Lakeshore Road (a right-in and a right-out) and some density reconfiguration. ► Site traffic circulation sketch: January 6, 2012 - proposed vehicular ingress and egress and public pedestrian access areas. E-mail your comments to Ward 1 Councillor Jim Tovey and the City Planner of Record, Ben Phillips. Please consider copying the TOPCA Executive so that we can best represent the community's views when taking a formal position. 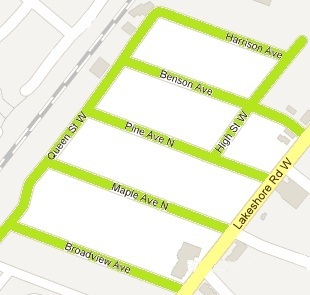 ► MAP (click) with residential streets in the immediate neighbourhood of the L/B/H site proposal. ► Inventory of Concerns: July 13, 2011 (2p PDF) compiled by the Neighbourhood Steering Committee. TOPCA COMMITTEE: TOPCA has formed a L/B/H Committee which includes Executive reps and TOPCA members from the immediate neighbourhood. This Committee was invited to meet with Tiffany Development on December 19, 2011. ► TOPCA Letter: December 22, 2011 sent in follow-up. The TOPCA L/B/H Committee held a Neighbourhood Meeting on February 2, 2012 at FIRST UNITED CHURCH. All residents of the immediate neighbourhood (map below), and all TOPCA members, were welcome to attend. ► MEETING SUMMARY (7p PDF).